People with dementia often live in the past because the disease may cause damage to the brain affecting memory ("Amnesia", one of the Seven A's of Dementia). We have to know about that past to be able to interact with the person in a meaningful way. Knowing their past gives us clues that can help us understand the nuances of their behavior and give us insight into their world. If we don't treat them in a way that is consistent with how they see themselves, in the best case we've simply missed an opportunity to make them feel good, in the worst case we may set up a situation that causes them to respond negatively (a responsive behavior). One resident that I know was the president of a large corporation. For much of his life he was used to being treated with respect and having people available to do his bidding. While obviously that situation can't be duplicated in a facility, if we understand this background we can treat him accordingly. Attempting to coerce him to do something instead of winning him over is likely to result in a negative response. 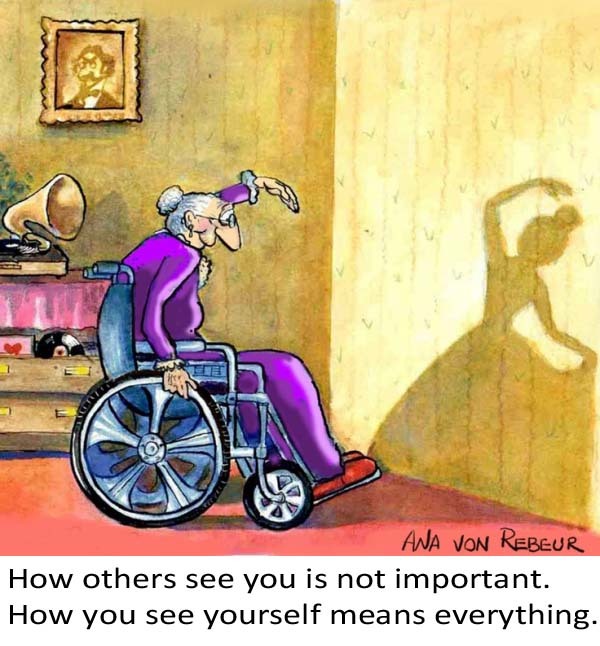 If we understand that the person in the cartoon still identifies herself as the ballerina that she was in her younger years we can treat her accordingly - tell her how gracefully she moves, offer to put her hair up in a bun the way she used to have it as a performer. If there are any programs or posters from her time as a ballerina they could be put in a place of honor in her room. We could talk to her about them and be sure to point them out to other caregivers and visitors.